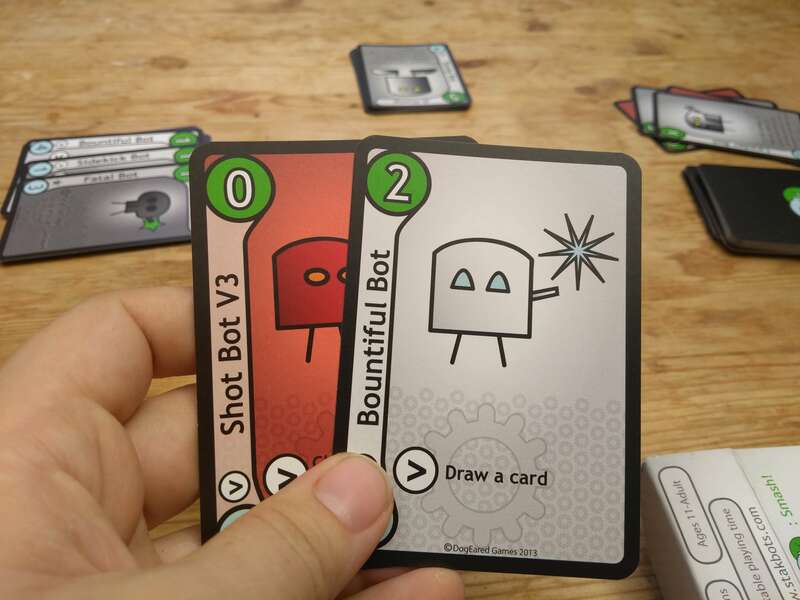 Stak Bots is a quick-to-play card game where you pit bots against each other — with a view to destroying the pile under an enemy player. Your bots each come with their own strengths as well as abilities and actions. These each need to be played out during turns and used to tactfully destroy other enemy bots. The aim of the game is to have at least one of your bots standing while all of the other bots on the field are destroyed. Today, we are talking about the base game Stak Bots, though there are a variety of expansions adding more and more bots to the game. 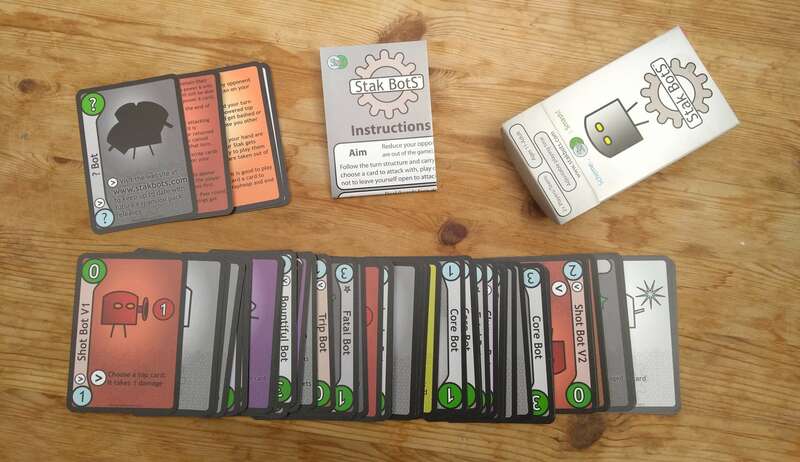 The game consists of a box of 60 bot cards, as well as four instruction cards to help you along the way. There are also more in-depth instructions in the included booklet. This tells you about various other ways you can play the game. The cards are of good quality and the instructions are clear and make sense. Everything easily fits inside the deck box, which can be chucked into a bag and taken with you anywhere due to its compact design. The game is very easy to understand and also quick to play, so you can take it with you and play against your friends wherever you go. The bot cards, specifically, have various numbers and components to them. There is a sidebar with the bot’s name as well as a symbol to show if it has an action or ability. Each card has a green circle with a number in it, this is the bot’s power. The number represents both the health of the card as well as the amount of damage it can do. If the health decreases, the damage does not decrease. Some have an ability, these affect how they are used in battle and what they do when attacked. Others have entry effects, which happen as soon as the card is flipped over. Finally, at the very bottom is a blue circle with a rank number in it, this doesn’t normally affect gameplay though. Each player is dealt nine cards in front of them in a face-down pile. This is your stack of bots. Everyone also starts with two cards in their hand which they can view. 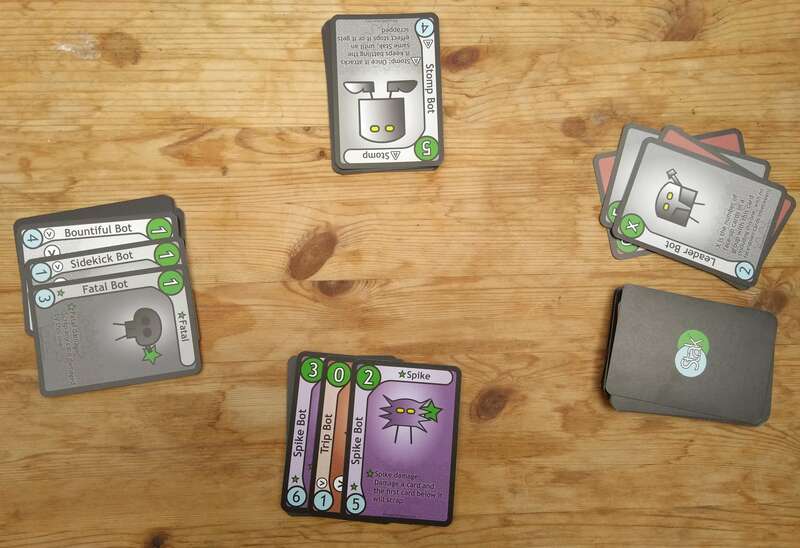 Once the game starts, each player will flip the top card of their bot pile face up, showing their current bot. During the very first turn, any instant actions are void. Once it is your turn you are able to draw a card from the deck, adding it to your hand. Then you can start making moves and working towards destroying other bots! You are able to play a card (or cards) from your hand, putting them face up on your bot pile, scrap your Stak’s top card (or any cards in your hand), and you can start attacking other bots. These three actions can be done in any order — but only one of your bots can attack per turn. To end your turn, one bot, either of your enemies or your own, must be put into the scrapyard of discarded bots. If you destroy an enemy’s bot, the next card in their Stak will be flipped up. If there is an instant action, represented by a “>”, that action will have to be fulfilled before continuing. Actions can end up chaining against other actions, causing chaos to ensue! It is critically important to note that your attacking bot heals at the end of each turn. This means that if you have a bot that has 5 health, destroy a bot with a strength of 3, and end your turn with 2 health, your bot instantly goes back up to a health of 5. This also happens if an enemy attacks your 5 health bot with a bot with the strength of 3. The bot with the strength of 3 will probably die, and a the end of the turn, your bot will gain back it’s 5 health points. You can stop attacking at any point (with most of your bots) unless they have an effect that says otherwise. Playing Stak Bots is super easy. Once you have played through a few games, you will start to really get into the flow of drawing, attacking, playing out your abilities, and continuing to destroy everyone in your path. Playing the game against one person is just as fun as playing against a group. However, when you play against multiple people you have the extra tactical layer of needing to watch each other, ensuring that nobody has too many bots in their stack. It does take some strategy and planning to keep your bots on top, but there is also an element of luck when it comes to the bots in your Stak and the bots you get in your hand. 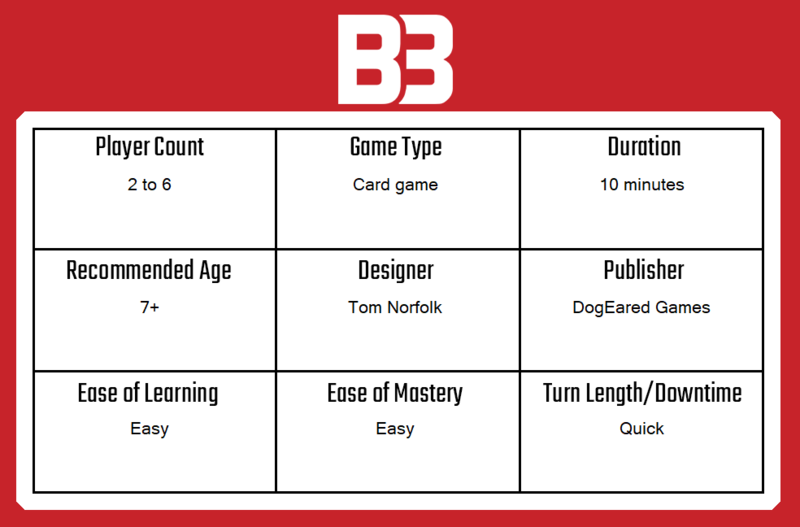 Although the game itself plays simply, don’t let these cute cards deceive you, you will need to figure out the best way to play and use them in order to win. I really enjoyed Stak Bots. I feel it is going to make it into my travel bag, going with me to other places to set up easily with friends. The game itself feels unique yet is quickly familiar and easy to understand. The bots are nice enough — with a decent variety of them and a nice amount of actions and health. While playing the game, it brings about the feeling of ‘one more round’ due to the speed and ease of the rounds. With a simple shuffle and deal of the cards you are starting a whole new round against your friends. Stak Bots is hard to put down! You can grab a copy of your own Stak Bots on their website here, for £9.